Aloke Finn, MD and colleagues show that mice lacking the protein CD163 show an enhanced repair response to ischemic injury. CD163 normally restrains TWEAK, which is released by white blood cells in response to injury. TWEAK stimulates muscle and blood vessel growth. 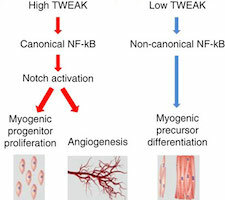 Researchers have identified a protein produced by white blood cells that puts the brakes on muscle repair after injury. The results were published online by Nature Communications on Wednesday, August 5. Finn says his team is currently investigating CD163’s effects on atherosclerosis. The first author of the Nature Communications paper is postdoctoral fellow Hirokuni Akahori, MD, PhD. The research was supported by the American Heart Association, the Carlyle Fraser Heart Center and by Emory's Woodruff Health Sciences Center.